We spent two months hiking and camping in Patagonia mostly on the Chilean side. During this time we had all kinds of weather; from hot sunny days to hail and storm wind – our gear never failed. Here you can find our best tips and recommendations what to pack when go hiking in Patagonia. Patagonia is a region at the southern end of South American continent shared between Chile and Argentina. It’s famous for breathtaking scenery, diverse landscape and unpredictable weather. A great place for adventure junkies and outdoor lovers, especially those who enjoys hiking. There are seven major national parks in Patagonia most of them have great hiking trails; Chile – Torres del Paine, Laguna San Rafael, Alberto de Agostini and Bernardo O’Higgins; Argentina – Los Glaciares, Nahuel Huapi and Tierra del Fuego. Total area – 1 million km. Population – 2 million people. Density – 2 persons per 1km. Two coasts – Pacific and Atlantic oceans. Patagonian desert is the largest desert in the Americas. According to archaeological finding the region was inhabited in 13th century BC. Tourism is one of the most important industries in the economy of Patagonia. Hiking like any outdoor activity involves risk of getting injury or losing some of the gear due to unpredictable weather conditions e.g. very strong wind that Patagonia is famous for or just losing your backpack like it happened to me hitchhiking in Patagonia. It’s always advisable to have travel insurance especially if you’re going on an adventure outside your own country. 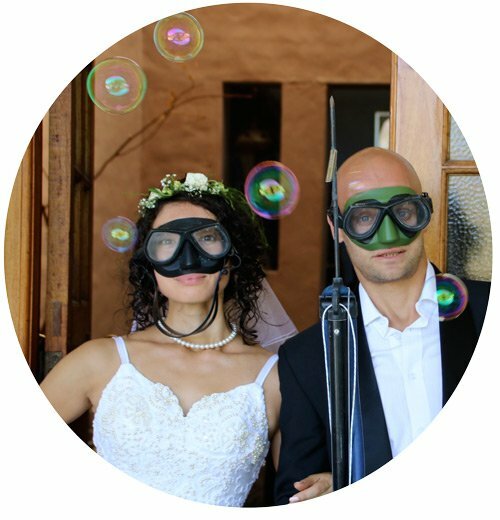 World Nomads insurance company operates all over the world, they have special packages for outdoor and hiking lovers. It doesn’t matter where you live or where you are at the moment, it takes less than 2 minutes to get a quote and you can buy it online even if you are already traveling. We advise always to read the small print and be sure you buy the correct policy. Be properly covered for injury, evacuation, gear loss, trip cancellation and trip delays. Want to know what other travelers say about World Nomads? Check out this post! First things first – a backpack; good fit, adjustable, light with several pockets and sections that you can easily get what yo want without unpacking everything. As for the size we’d suggest 60-70L for guys and 50-60L for girls, don’t take a huge backpack you’ll likely overload it and pack unnecessary stuff. A backpack rain cover is a must have for Patagonia. If you are planning to do many multi day hikes it make sense to invest in it and buy a light and good quality one like Deuter ACT or Osprey Atmos. If you go on a hike every once in a while and don’t want to spend too much on gear – buy cheaper model like Teton Escape or High Sierra Sentinel. For ladies if you want to invest in a prime quality backpack look at Deuter ACT Lite 60, Deuter ACT Lite 50 or Osprey Atmos AG50, for a budget option check High Sierra Explorer models. good quality – won’t fell apart after one hike. Temperature is not a big problem here in summer it’s quite comfortable not hot and not cold, nice for hiking, no need to bring heavy winter hiking boots. The only problem it might rain that’s why it’s better to have waterproof shoes. If you like low shoes – Merrell Moab 2 Waterproof or Salomon X Ultra Prime are good option for you; durable, waterproof, comfortable, have good grip. For those who prefer high-cut models – KEEN Targhee II Waterproof or more budget option – Columbia Granite Ridge. For ladies – if you (like me) prefer to full-leather boots light and more ‘girly’ options – look at KEEN Targhee II, Salomon Ellipse 2 or Merrell Moab 2 Waterproof. If you’re looking for something cheaper Columbia Dakota Drifter is a good option. By the way I just bought a new pair of Salomon Ellipse, haven’t walked in them yet. I’m going to challenge them soon; first 900km+ in Spain on Camino de Santiago (mostly asphalt road) and after a couple of high altitude hikes in Huaraz, Peru. These shoes were the best alternative for both road and off-road walking. Hiking poles – if you are used to walk with them or maybe have some knee issues we’d definitely recommend to take them with. There are steep rocky descends on some hikes where poles will be quite helpful. Choosing poles make sure they have anti shock mechanism, rubber tip and comfortable grips. Water bottle – to get water is not a problem in Patagonia, its quality is good we didn’t use any filters but if your stomach is very sensitive better bring a LifeStraw. Some people like hiking with hydration bladder but for Patagonia where you can get water everywhere it’s too much of a mission to unpack a camel pack every time you want to fill it. Bottles with wide mouth are easier to fill in rivers and streams. There were so many rivers and streams in Torres del Paine that we ended up walking with camping mugs attached with carabiners to our backpacks, every time we hit a water source we just drank out of the mugs. Ziploc bags or waterproof pouch to keep valuables e.g. money, documents, maps, tickets clean and dry. When you go hiking don’t forget to pack plastic bags for rubbish don’t leave any garbage behind. Tent – it must be; waterproof, have enough space to fit backpacks inside, wind resistant, light and easy to pitch. If you’re an active hiker and camper we’d recommend to invest more and buy an awesome tent that you’ll be using for years like MSR Hubba Hubba NX – it’s very light (1,3kg), packs small, easy to pitch, waterproof, it’s shape is great for strong wind and it’s durable. If you go hiking every once in a while buy one of the middle price range tents like MSR Elixir, Marmot Catalyst, REI Passage or Hyke and Byke Zion. These tents are waterproof, relatively light, easy to pitch and spacious enough. We just ordered MSR Elixir tent, we’re going to take it on our next hiking mission in Huaraz, Peru. Sleeping pad/mattress is definitely a must have item – isolation and comfort for sleeping in a tent. We recommend inflatable camping pad – they’re more comfortable than foam pads; they pack small and can fit inside a backpack. I know you can attach a foam mat outside your backpack but if it rains it can get wet, plus after traveling with it for a month or two it gets dirty and dilapidated. When buy an inflatable mat make sure it has a good valve that seals proper. Sleeping bag – to buy a down or a synthetic bag is a difficult decision. I like down sleeping bags because they’re light and pack small, plus they are very cozy and soft. Modern synthetic bags are good; easy to wash and dry quick, if you buy a more expensive model they pack quite small and are light. It can rain quite a bit in Patagonia make sure your bag doesn’t get wet especially if it’s a down one, for an extra protection put it in a plastic bag inside your backpack. For camping is summer a sleeping bag with comfort minimum around 0°C/32°F will be more than enough. For synthetic sleeping bags Kelty Tuck or Teton Sport TrailHead is a good and budget option. Down bags are usually more expensive but they are lighter and compress quite a lot, check these models; Vitals Summit 20 and EOLUS 800. Towel – microfiber camping towels are the best for hiking and camping; dry quick, pack small, very light and my favorite – come in different sizes and colors. Camping stove – for hiking in Patagonia you need one, it’s possible to get a cooked meal only on some routes in Torres del Paine. Portable camping stove are awesome, we’ve been using ours for 3 years, camping and hiking a lot and it’s still alive and works great. Buy a stove with Piezo Ignition to be able to light it without matches or lighter (in case you lose of forget them). Modern stoves weigh nothing and fold very small, you can basically put it in your pocket. When buying a stove make sure it screws onto canisters (most modern stoves do), you can unscrew it and pack away any time. You can buy screw-in gas canisters in any town in Patagonia. Stove screen – Southern Patagonia famous for winds to have a makes cooking in strong wind easier and saves gas. Ohuhu camp stove windshield is a great option for hiking – it weighs nothing (274 g/0,6 lbs), folds small, adjustable size and has pegs to secure it into ground. Camping pots – you can easily get away with only one pot and use it for both cooking and boiling water, we’re both big coffee junkies and drink coffee every time we have a chance so boiling water happens quite often for this reason we usually take 2 pots; one big for cooking and a small for boiling water. Take pots with lids you can use them as plates, plus using they when cooking saves save gas. Don’t forget to pack a cup/mug, spork/fork and spoon, plates (optional). As an option you can buy a cooking set with pots, stove, bowls, spork etc. there are many variations. Pocket knife – super handy item can be used as knife, can and bottle opener, scissors etc. We’ve been using the same Swiss knife for years and it still works perfect. Headlamp – will be handy, it’s always nice to have one though in Patagonia in summer you have long daylight hours, up to 18 hours; basically it’s still light when you go to bed and already light when you wake up but for reading a headlamp is quite useful unless you have a Paperwhite Kindle of course. Padlock – very handy to have one for hostels, camping, luggage storage etc. We usually use a padlock to lock our tent when we go away for a walk or shopping. Jacket – must be water and windproof with a hood, make sure zips on your jacket are good quality it’s annoying when you struggle zipping in up. Rain poncho – the easiest and the most budget option to stay dry in pouring rain, buy poncho that can fit over your backpack then you can be sure you and your stuff will stay dry on a hike. Hiking shirt – long sleeve shirts are the best; protect from the sun (no need to put tons of sunscreen), protect from mosquito and other insects, it’s quite a problem in Patagonia in summer. For men – Campbell has been hiking in Columbia shirts for years – good quality, breathable fabric, UPF40+, dry quick, easy to wash and long-lasting. For women – I always take one long sleeve hiking shirt and one long/short sleeve running shirt. Don’t forget to pack sport bras – they’re more comfortable for outdoor activities than normal bras, plus don’t take any space and easy to wash and dry. Hiking pants – take long pants in case you walk through long grass, plus insect and sun protection. For women – a good combination is to take one pair of normal hiking pants and a pair of yoga pants. For men – light fast dry hiking pants that convert to shorts for summer months or warmer waterproof pants for off season. Fleece – always have a fleece with when hiking in Patagonia even if it’s quite warm during the day it’ll get colder in the evening, it’s nice to put on a warm soft fleece when cooking or just sitting outside in a campsite. There are so many color options for ladies – for me it’s the most difficult part to choose one. Socks – for hiking we recommend wearing merino wool socks, they are really great; don’t absorb odors, very durable, dry quick and are good protection from blisters. For even more comfortable walk buy Darn Tough hiking socks they’re famous for great foot support and blister protection and they actually look quite funky (the ladies models). Beanie – take a small and light beanie in case of strong wind – it takes no space and might be handy. Gloves – same, take a pair of light thin gloves just to give some extra warmth to your hands if it gets really chilly early morning or at night. Cap or hat – a must have item in summer in Patagonia especially if you’re planning do to multi-day hikes. For me cap is more comfortable for hiking but hat definitely protects better as it covers larger area. Buff/headwear – it’s multi-functioning – can be used like bandanna, balaclava, face mask, neck gaiter, headband, hair rubber etc. Sunglasses – another must have sun protection item; for hiking buy sunglasses with high UV protection and polarized lens. Comfortable pants for sleeping I’d suggest long pants (men’s option) if you’re going to camp; first for keeping you warm and second for protecting from insects. Shirt for sleeping – a cotton shirt (men’t option) will be enough. If you get cold easily or your sleeping bag is not very warm pack thermal set for sleeping and changing into after walking. Cotton socks for sleeping in case it gets cold. Swimming costume – on some hikes where there is no shower facilities it’s nice to refresh in a river or lake. Flip-flops – you know how nice it is after a long walking day to take off your hiking shoes and put on comfortable flip-flops (women’s option). Camera – for us it’s always a difficult decision to a mirror camera on a hike or a small mirrorless one, every extra kilogram is count when you walk for a week with your backpack full of stuff but at the same time you see some amazing places and want to get best photos of them. We always travel with our Canon EOS 80D but when we go on a multi day hike we take a small alternative mirrorless Olympus OM-D, it’s very light and quite small. Drone – the main problem with drones in Patagonia will be strong wind especially for small drones like . The scenery in Patagonia is breathtaking and I can imagine what awesome footage you can get with a drone. To be honest to take a drone plus batteries on a multi day hike where you have to carry camping gear and food is a bit too much. Keep in mind drones are not allowed in some National parks e.g. Torres del Paine. DJI Spark is probably the best option for traveling; small, light, takes good footage. GoPro – easy to use, waterproof, light and takes good enough footage – a good alternative to big cameras. GoPro Hero6 Black is an excellent little camera. If you want a budget alternative check AKASO EK7000 it might be not as great as GoPro but costs less than half. Power bank – will be very handy for multi day hikes except for Torres del Paine most of other hiking trail don’t offer much facilities like power outlets and electricity. If your can charge your phone, Kindle or GoPro during a hike a power bank is a must have. GPS watch – always nice to have one to check exact distances you walk and elevation profile, plus having navigation can be handy for some remote hikes. Garmin Fenix 3 will be our next big investment in hiking gear. Smartphone – we use our phones a lot for navigating, finding accommodation and trails, taking photos and video for Instagram stories, listening music, setting alarm and connecting with the world when traveling. Buy a local SIM card and keep in tough with your friends and family. Earphones – sometimes it’s nice to listen to music or audio-book when hiking or chilling in a tent. Kindle – Campbell’s best friend on any hike. Kindle Paperwhite is great; it gives you a great range of books to read, you can download several books and choose what you want to read later, you don’t need to use a headlamp and its battery lasts for quite a while. If you’re a reader think about joining Amazon Kindle unlimited program – you get an unlimited assess to hundreds of thousands of eBooks and audio-books. 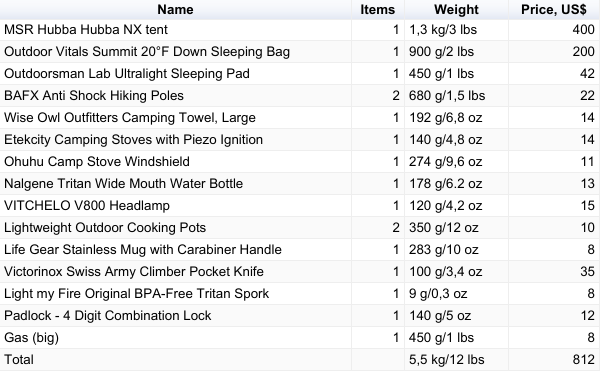 Download complete Patagonia packing list. Windy is probably the main characteristic of Patagonian weather with strong winds blowing all year around and getting especially furious in summer months of December and January spoiling nice summer days. 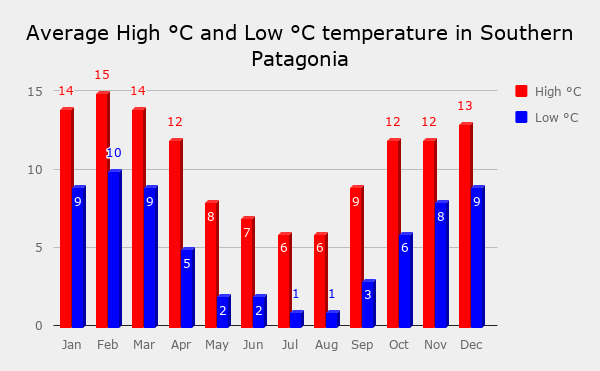 There are four seasons in Patagonia; summer – December – February; fall – March – May; winter – June – August and spring – September – November. Best time for hiking in the area is between November and March, the warmest period though it has its disadvantages like strong wind and frequent rainfalls. 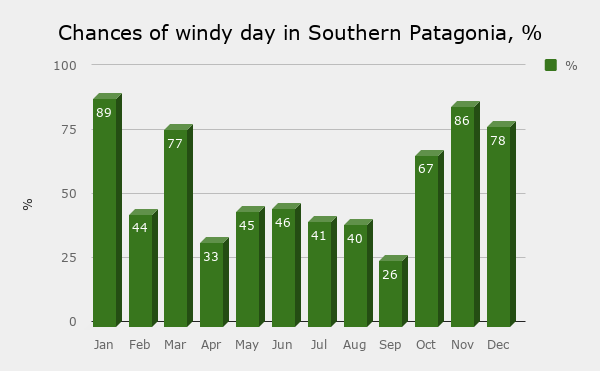 November, December, January and March are the windiest months in Southern Patagonia* when your chances of having a windy day are between 80% and 90%. Out of summer months February is the least windy. 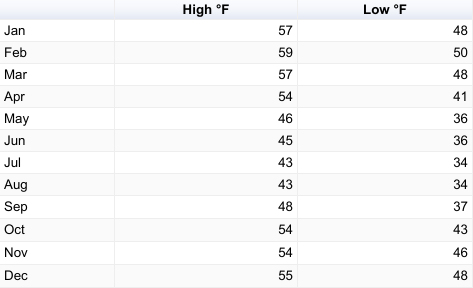 *Weather data for Torres del Paine National park. From October to April day temperature varies between 12°C-15°C/54°F-59°F, warmest nights are between December and March, around 10°C. May to September are the coldest months in some areas temperatures go down below 0°C/32°F. Some trails e.g. O-circuit in Torres del Paine, are closed for off season, not the best time for exploring Patagonia. Summer and fall months get the most rain though chances of rain are less than 40%. February is again the most favorable months for hiking with the least rain. To resume all the above February in general is the best month for hiking in Patagonia; not much wind, warm and little rain the only disadvantage of hiking in Southern Patagonia in February is amount of tourists, it’s the busiest month here. This is by far the most comprehensive article I have read with regards to hiking and camping in Paragonia. You are AMAZING! Our previous planned trip didn’t go so well as we were there in February. Believe it or not but we were actually completely rained out. We were fortunate enough to have stayed in an ecocamp that made the stay dry and comfortable. We would like to go again – When exactly did you go and what was your weather like? I do not want to brave this trip again and risk the rain. It’s either rain or wind. Such a hard choice! Dear, Elnore! Thank you very much for your comment! 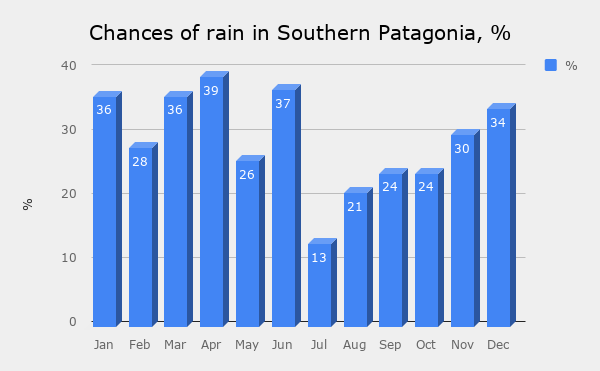 As we know February is the least rainy and windy month in Patagonia you must have been very unlucky. We were there in February and March rain wasn’t a problem, we had very few rainy days. PS. We have some great gear recommendations for rainy weather in this post – feel free to purchase anything though OUR links. We hope next time you will be more lucky with the weather in Patagonia. Great tips! Wondering if you brought ALL the things you were traveling with while camping in Patagonia, or if there are places to leave a bag and only bring the hiking/camping stuff? We will be traveling for a bit and doing more than camping and definitely could not lug it on a multi day hike. Thoughts? Hi, Nicoletta! When we went hiking we took only gear and food that we needed for a hike, not all our stuff. We usually left it in hostels/campsites in towns, e.g. Cerro Castillo Village, Puerto Natales, El Chalten. If you stay or camp in a place before a hike they will usually let you leave your extra stuff there for free. The only time we had all our things with, plus food for a couple of days is when we walked from O’Higgins, Chile to El Chalten, Argentina and it was quite tough walk with two backpacks each. Hi, Amanda! Thank you for the question! There were second-hand clothes shops in Coyhaique as well as local shoe shops where we bought a pair of hiking boots for cheap though they were bad quality and were destroyed after 3-4 long hikes. Good luck! Hey. Do you know if the second hand shops in Coyhaique sell camping gear? Hi, Kim! We didn’t see any secondhand gear shop in Coyhaique, only clothes. We couldn’t find a second-hand sleeping bag there and had to buy a brand new backpack in a local gear shop. You have better chances with second-hand in Puerto Natales.